Cebu is an island province consisting of the main island and 167 surrounding islands and islets. Cebu City is a Spanish colonial city with many buildings and places of interest where the past can be discovered again. As one of the oldest and fastest growing cities in the Philippines, it attracts a diverse range of people and has become famous for its eclectic and delicious street food. Explore the rich heritage and culture of Cebu on a Cebu holiday package that takes you directly into the heart of a thriving and bustling city. 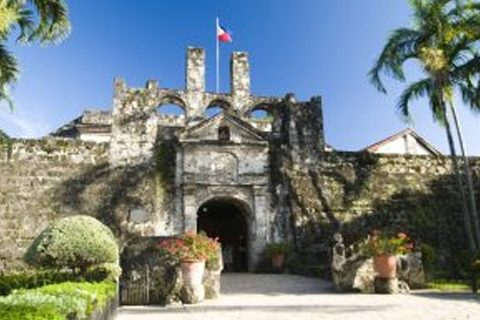 Start your exploration of Cebu by learning about Spanish Colonial history in the Philippines. Visit remaining buildings and structures where you’ll find the rich history of some of the greatest seafarers and explorers in history. The Basilica del Santo Nino was built in 1565 and is the oldest Catholic Church in the Philippines. The wooden image of Santo Nino is housed here and its existence today is revered as evidence of a miracle due to it surviving a fire here completely untouched. Magellan’s Cross is housed in the chapel next door. It was erected here by Spanish and Portuguese explorers in 1521 and also holds mystical appeal. See Spanish history in the Philippines depicted in the painted chapel ceiling that tells the story of the landing of Magellan in Cebu. Explore Fort San Pedro and see well-preserved artefacts, paintings, and sculptures. Your local guide will give you insights into the history of Spanish occupation here. Sumilon Island is considered to be one of the most beautiful islands in Cebu. It has beaches of soft, fine white sand and crystal clear blue water. Take the opportunity to try all those water sports you’ve longed to do – snorkelling, kayaking, parasailing, or even jet skiing. You can feed the fish or try fishing yourself, or you can take a hike around the island on a clearly marked walking track. The views are worth it and a swim in the water afterwards will be even more enjoyable. We can arrange all of these activities for you with your Cebu travel package. When you arrive in Cebu, you will see the mountainous terrain that serves as a backdrop to the city. If you enjoy keeping fit and want to experience fantastic views hike to the top of Mount Babgag. A great excursion to do on your Cebu tour package for those with good physical fitness. Cebu has many natural wonders to enjoy. Let us arrange a day trip to Oslob on your Cebu travel package where you can observe whale sharks as they swim in the local waters. Take photos from the boat or enter the water for a once-in-a-lifetime encounter snorkelling beside these beautiful and docile creatures. We respect local culture and wildlife and ensure that we minimise any impact when swimming with whale sharks. Visit the enchanting Tumalog Falls where you walk through lush rainforest to view the expanse of water tumbling down the cliff face. Book a Cebu holiday package today and discover the best of Cebu. CONTACT US: EMAIL: info@alluciatours.com.au OR VISIT US: www.alluciatours.com.au For this Fantastic Unforgettable Adventure.